Your jewellery is a key part of your bridal outfit, especially the bridal necklace. You need to pick something that perfectly fits and complements your bridal gown. Depending on the type of dress you have, different wedding necklace styles can make a big difference to your look and can ensure the whole outfit works well together. An elegant necklace best worn with a strapless dress, the bib has a draped fringe look with strings of beads or gemstones floating down from the main necklace. It is similar in style to a choker. The shape created by the fringe of beads or stones looks like a bib – hence the name. This wedding necklace style may also be known simply as a fringe. A bolo is often made from either leather or chain material. It is a necklace that is tightened at the front and has a small bead that slides up to the throat leaving the two ends hanging loosely. 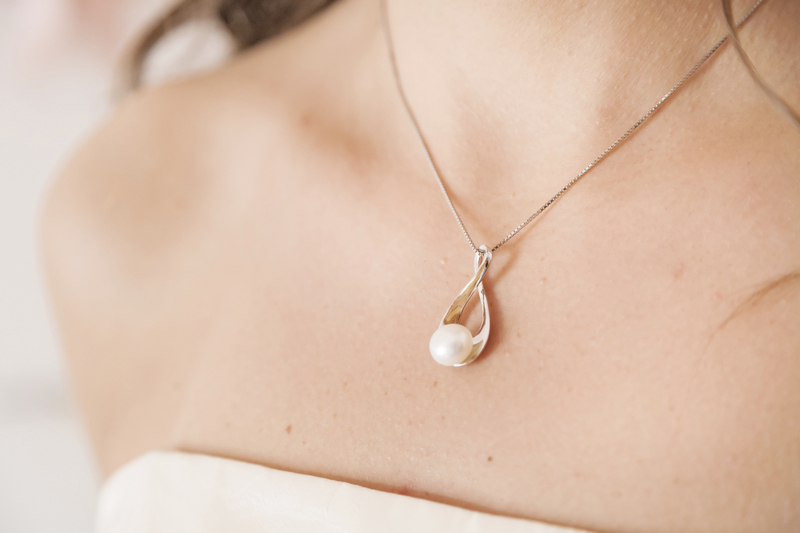 It is one of the more casual wedding necklace styles – ideal for a casual wedding. This is similar to a collar, but it is formed of a single strand necklace instead of having multiple strands like collar. It is often between 14″ and 16″ in length and can incorporate materials such as ribbon or leather, or be made from a string of beads or pearls. The snug fit of the choker accentuates the neck, and it looks particularly great together with wedding dresses with a moderately high round neckline. A collar-style bridal necklace is a glamorous option that is ideal for a long neck. This style of wedding necklace fits snuggly around the neck and generally includes more than one strand, making it a bit wider than a choker. A classic look would be a pearl collar, which could have three strands of pearls stacked tightly one on top of the other. If a central ornament is included on a collar, it is known as a collarette. An esclavage style wedding necklace includes a number of strings, often three in total, all of different lengths. The top strand is the shortest, quite often being about the length of a choker, and the strands become gradually longer so that there is a gap between each one when the necklace is worn. A modern twist on this look is to have fine wire strands with sparsely spaced pearls or beads. A festoon is an intricate necklace, often made with strings of pearls or beads, even though chains can work equally well. This necklace features a choker style strand or chain, together with many other strands that hang from it and loop back up to meet it again, creating an elaborate pattern. This wedding necklace style is best worn with a simple strapless dress. A number of brides choose to wear an antique locket as their ‘something old’ or ‘something borrowed’, and these can be a beautiful way to carry a picture of an absent friend with you on your special day. A locket is quite like a pendant, but it features an ornament that opens up to create space for a picture or object. 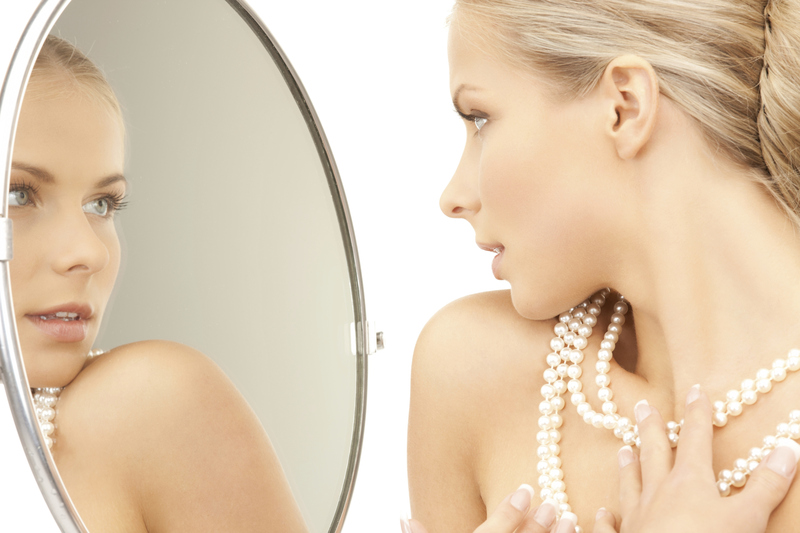 A pendant is made up of a single gem stone or charm that hangs from a chain around the neck. Pendants are typically longer than chokers but they can be just about any length to suit the neckline of the dress. An example of a classic pendant would be a drop shaped diamond stone on a silver chain or a cross on a gold chain. A long single strand of beads is a fashionable choice, and to add interest the beads could vary in size increasing towards the centre. Various lengths consists of princess length which is 18″, matinee length which is 22″, opera length which is 30″, and rope length which is around 60″. This necklace is the perfect fit with a gown that has a V shaped neckline. It also pairs well with curvier brides as it takes away the attention down through the centre of the body and this has a sliming effect. A Y necklace is a single strand necklace in combination with a small chain or string of beads that hangs down at the throat creating a Y shape.